The strategies and priorities of the corporate disclosure regulators in Australia are not entirely clear. This article calls for a bold and effective regulatory framework in order to achieve the policy goals of market fairness and economic efficiency. It argues that this requires the regulators to place greater emphasis on compliance with, and enforcement of, the periodic and continuous disclosure obligations. 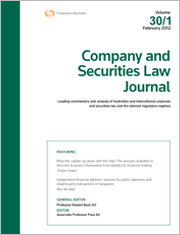 The full article can be accessed here: “A call for a bold and effective corporate disclosure regulatory framework” (2010) 28 C&SLJ 331. * Research Fellow, Faculty of Law, University of New South Wales. Is the accessibility of information on the WWW disrupting the foundation and rationale of the patent system of disclosure in exchange for grant of a patent?